“I was looking for ways to educate more people about the importance of native plants to insects and birds—the whole ecosystem,” says Lecourt. As the women walked around the planter box outside the brick building, they discussed the plants currently growing there. Most were invasive species, and the large Hollywood Juniper in the center of the box was in a dangerous position. 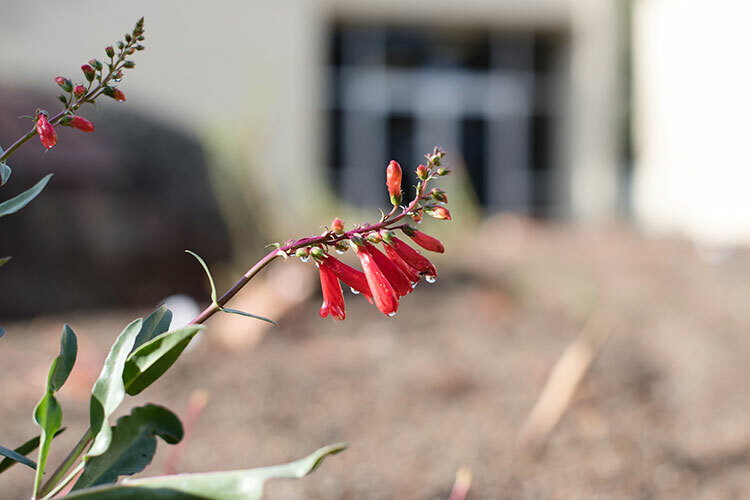 That quarter, Wyrick had students in her Native Plant Cultivation class begin mapping out a new garden for that space; one that would feature native species, making the garden a healthier option for the local ecosystem. One such student was Kari Stickle, a senior health sciences and Italian double major. As a passionate, self-proclaimed plant-lover, she not only produced many illustrations of the garden’s design, but also spent several hours outside of class weeding the plot on her own. Stickle strongly believes proximity between people and plants is important, and feels the native plant garden at the post office will not only remind people of the benefit of being around plants, but also introduce them to local flora of the region. Students in Wyrick’s Propagating Native Plants class worked on planning the garden. They studied conditions needed for various native plants, learned to propagate many of them in the department’s greenhouse, observed sun and shade patterns in the garden plot, studied potential effects on surrounding nature, and spent hours digging out the previous invasive vines and plants. Cheryl Elmendorf, a then-local adult learner who has always been fascinated with plants and decided to take several biology classes to expand her knowledge, was part of that class. Her passion for native flora across the U.S. fuels her joy in sharing local knowledge with the community. In planning the garden, the class also emphasized plants that attract showy pollinators; specifically butterflies. Plants in the final layout included California fuschia, California lilac, lupine, mallow, manzanita, milkweed, penstemon, pipevine, sage, toyon, western redbud, yarrow, poppies, flax, owl clover, and several species of native grass and succulents. In preparation for the planting, the PUC landscaping team applied herbicide to kill an invasive plant, tilled the bed, and removed several of the pre-existing ornamental species, including the large juniper. Several faculty and staff also volunteered to weed the bed and donated plants. The new garden was installed in the planter between Silverado Credit Union and the Angwin Post Office on Nov. 4. Wyrick and Lecourt were joined by Rachelle Davis, chair of the department of music, for the planting. Though the garden will take a few years to fully establish, the department of biology will continue to tend it, adding plant identification markers and interpretive signs to educate passers-by about the biology and ecology of the plants in the garden and the animals they support.